Ask and you shall receive! 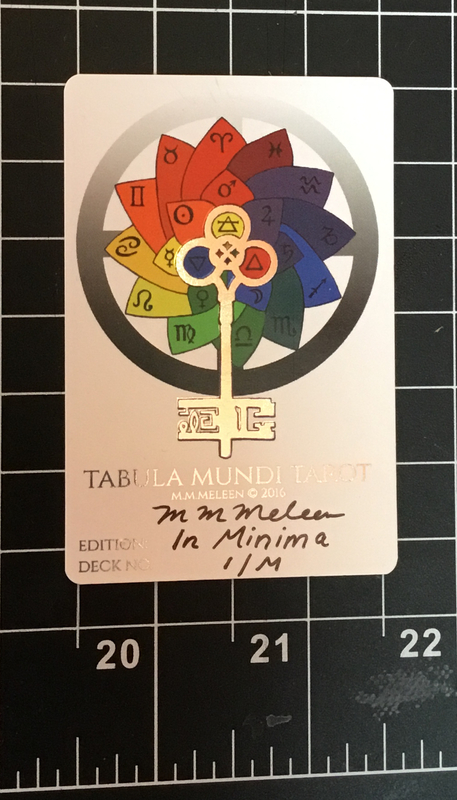 Enough people asked for a Pocket Size edition of Tabula Mundi Tarot, so here it comes: Tabula Mundi, the In Minima edition. I asked you all in February to vote in two polls. One was for the size, and one for the container. The results are in! And they match what I thought was the best choice too, even though I also want to do the others some day! For the size, the “same size as Pocket Rosetta” won out. For the container, the “extra sturdy box to match the full size box” won out. You can see the poll results at the bottom of this post. So, why do I think that this was the best choice for now? 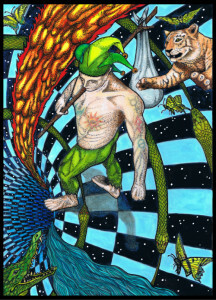 Well, I do think the mid-size version sized like the small Thoth Tarot, is a great idea, and I hope to do that someday. 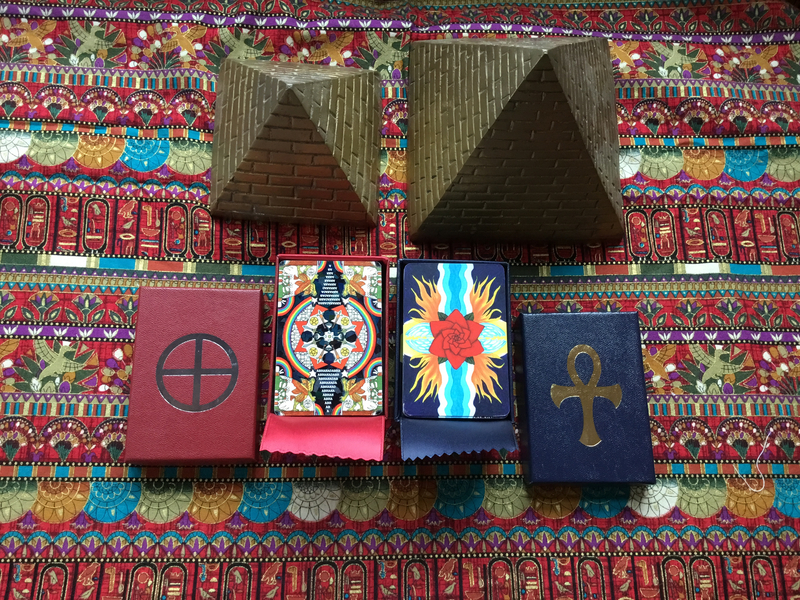 But I wanted these to be truly an exquisite little pocket size, perfect for carrying in your bag or pocket, and the right size for small Tarot magick lay outs, as described in the book “Portable Magic” by Donald Tyson. 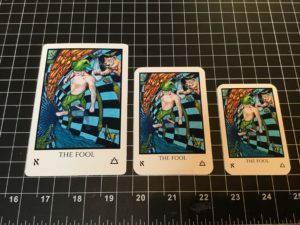 The mid size deck is a great size, but it really is about the size of many full size decks; it isn’t really that portable. But the wee one is just right for that. As far as the “tin-vs-box” question, the mini-me box was the right choice for these. 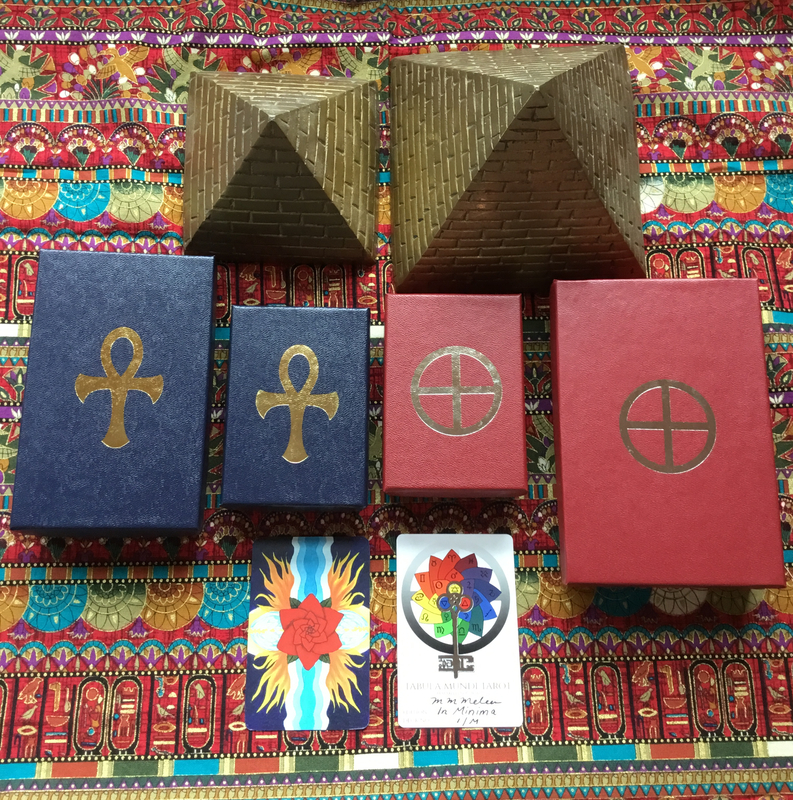 Not only is it much higher quality than a tin, and far more beautiful, but the cards will fit precisely into the custom made box. The stack of cards were just too tall for the tins that were available to me for this size deck, as the card stock used, is thicker than it was when the mini Rosetta-in-a-tin was printed. The stock for the Tabula Mundi In Minima is the same as the full size Tabula Mundi, and the full size Rosetta Papyrus. But when the original Rosetta and Rosetta-in-a-tin decks were printed, a thinner stock was used. That stock is no longer compatible with the machine that my printers use. Their new machine is awesome, and the colors are so much better in the new Rosetta, so it is no loss as the stock is just right now. If I ever do the mid size decks, I did find tins that would work and are tall enough. But I did not really like the way those tins were constructed, as they had a quarter inch tall lip around the bottom, that made the tin take up more room than needed and made it uncomfortable in the pocket. So, for those reasons, though I did not vote in the poll, my vote would have been the same as the results. 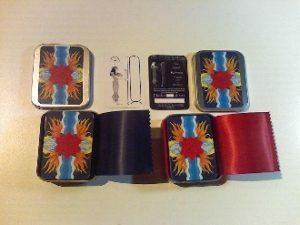 By the way, the mini Rosetta-in-a-tin deck is now SOLD OUT as of yesterday. 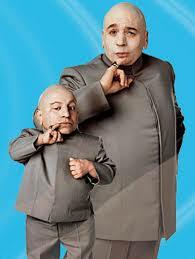 It needs a mini-me box and a printing on the new machine too! 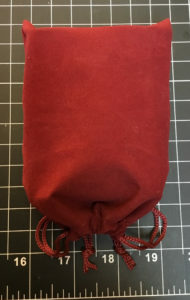 I think a mini box for a new edition of those might be in order. 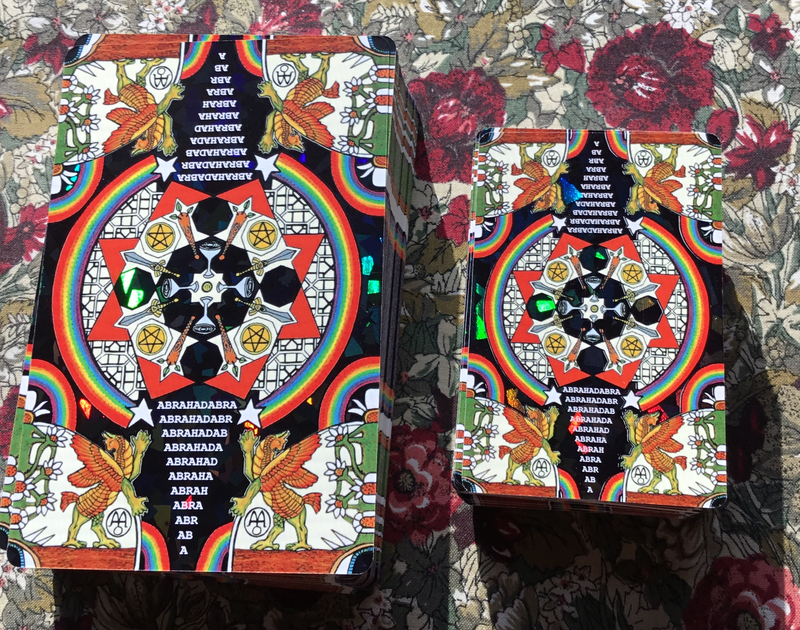 Now both decks will have matching mini-me boxes! I got a sample of the mini Tabula Mundi deck. It is adorable! Not weird at all except you think you are seeing double. Exactly like the full size decks in every way, including the holographic rainbow bling on the card backs! But, in miniature! There really is something compelling about things exquisitely formed in a tiny size. What is even cooler, is that the holographic effect is even more pronounced on the little ones, as relatively, the “flashing” shapes are larger as compared to the rest of the card. 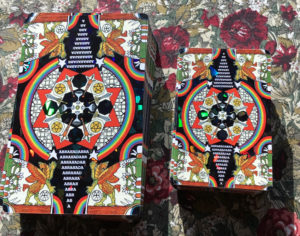 It is really hard to photo, but here is a photo – and even better, a 22 second video to show the bling in motion on the wee decks. And in case you are wondering, will these boxes be sturdy for travel, like a tin? The answer is yes, and I think even better. While it is true the tins are nearly indestructible, any sticker on the outside of a tin gets roughed up pretty quickly, and the metal of the tins does scratch easily. The boxes are just as durable as they are made just like the full size boxes, but in an even thicker weight of chipboard. The paper on them is pretty tough too. 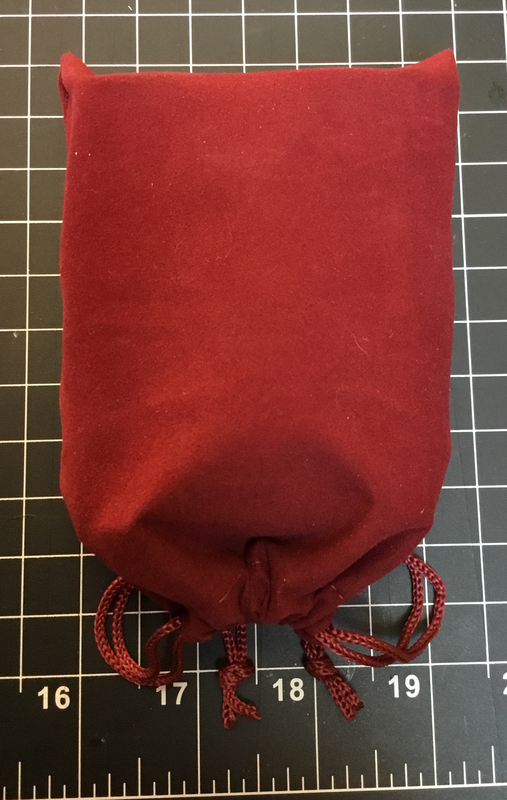 But just to make sure they are truly portable with no fears, they will come inside a little bag of suede-like fabric that the box fits perfectly into! 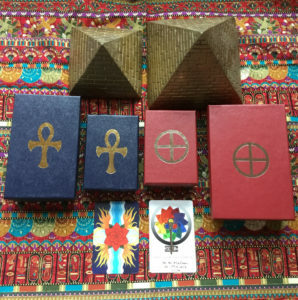 I have a picture of the boxes! 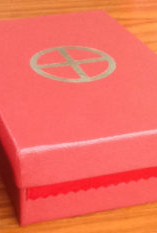 They are just like the full size boxes, same lovely foil embossed paper, same satin ribbon linings. Just smaller! There won’t be an option to add the expansion pack though. Doing those would have required the box be made a full quarter inch taller, reducing the portability factor and leaving unnecessary extra room in the box for those who did not want them. It made the decks more like a little brick, and not as easy to slide into a pocket. I would have loved to do those too but under the circumstances I decided not to add them. Since I opted for the blingy backs and boxes instead of tins, I also had to reduce cost on this project somehow, as it is hard to fund. The bling is outrageously costly (but so worth it, I think) and the boxes cost more than tins. Oddly, the mini boxes cost more than the full size ones. But again, worth it. The business person says no to what the artist says yes to. Thank god I wear both hats! So when will these be available? Very, very soon. As in, probably next week! Those of you who are signed up for the newsletter will hear the date first, as well as those of you who have asked to be “on the list” who will also get an advance email with the exact date and time they go up as well as an email with a live link after they are up. So you guys will get first dibs at them. Once the listing is up and you have been notified, only then will I post any links elsewhere. But feel free to spread the word: the minis are coming! 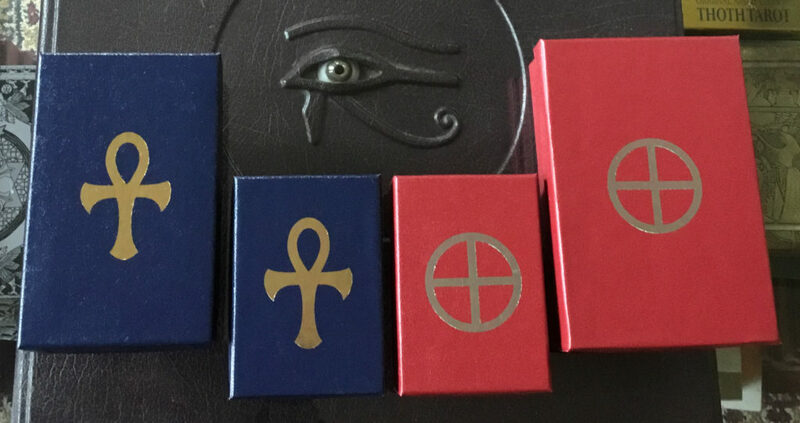 So check in at http://www.tarotcart.com in a few days! Try the Hot Pockets; they’re breathtaking! 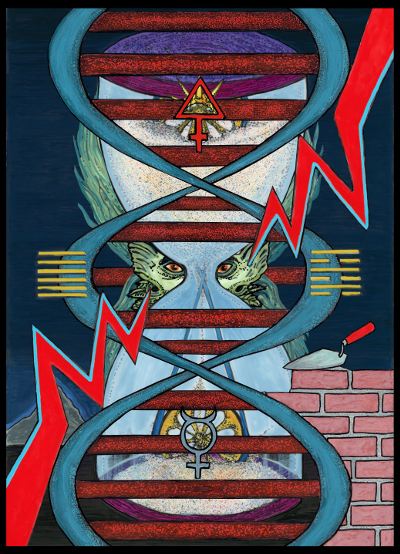 Due to popular request, I added one more card to the pocket size Tabula Mundi In Minima: Lust, In Nomine Babalon. I had to contact the printers and have them set up the machine again do a separate run of that one card, since the decks were already being shrink wrapped. So it will come as a separate add on, but anyone who orders in the first few days beginning on launch 3/6/18 will automatically have it free as my gift to you. I’m so glad you asked for her to be included. 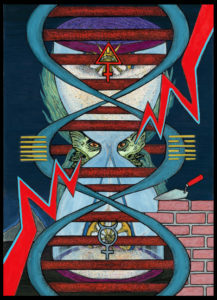 While we won’t get the decans, is there any hope for an In Nomine Babalon Lust card in this new size? Hey, interesting question. You know, it was not planned on. They would however fit fine in the new boxes. So it is an option I could add later. Or pester my printers even more than I already do, and add another card. I’ll see, they already started shipping the first of the decks. 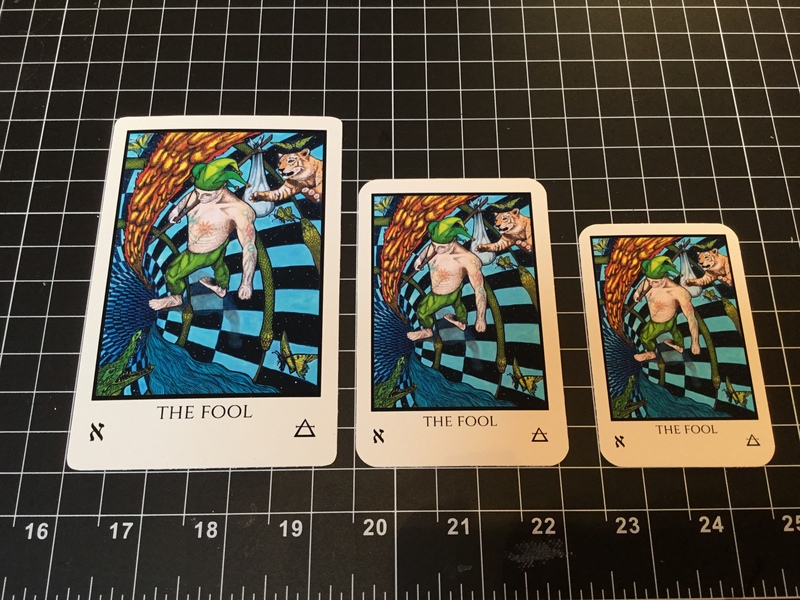 I already have them working hard to get some here this week (so I can get them to everyone this week as foretold, and get back to working on my new deck project!) 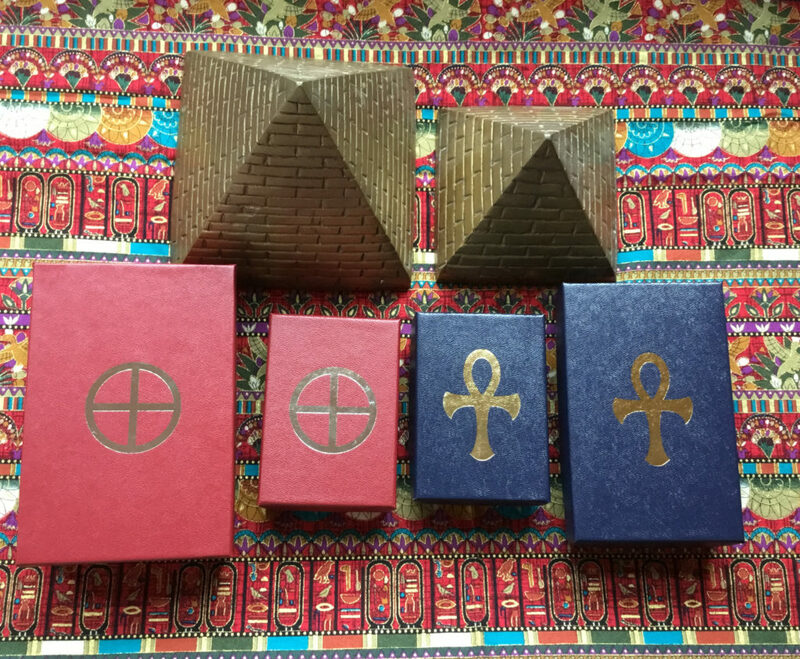 Right now, the only way to get the Babalon Lust card remains buying the expansion pack with a full sized deck. OK, I have sent a query to the printers. So, may it happen, In Nomine Babalon. WOW can’t wait for this version to be available. I am totally getting one. Mel, nice call on getting the bling in the backs. Definitely worth it! Glad you did, minimus Tabula Mundi will be a perfect mini match!